Product Placement is a series of site-specific, sculptural, public art interventions/happenings to be executed in urban, suburban, and natural landscape contexts in Kansas City and the surrounding region. The works will consist of 36” diameter, round, red, white and blue, helium filled, latex balloons with a single word of text printed onto them. A sculpture will be created by precisely installing (planting) in a minimalist grid in a farming field in Kansas. The subtle or dramatic shifts in weather conditions will animate this work in provocative ways. In a series of public art interventions, May plans to take other balloons on various urban/suburban walks and drives. Some will be embedded as text-balloon product-surrogates in and among the products at Costco, and May will go through the actions of shopping, acquiring, purchasing, transporting & consuming. 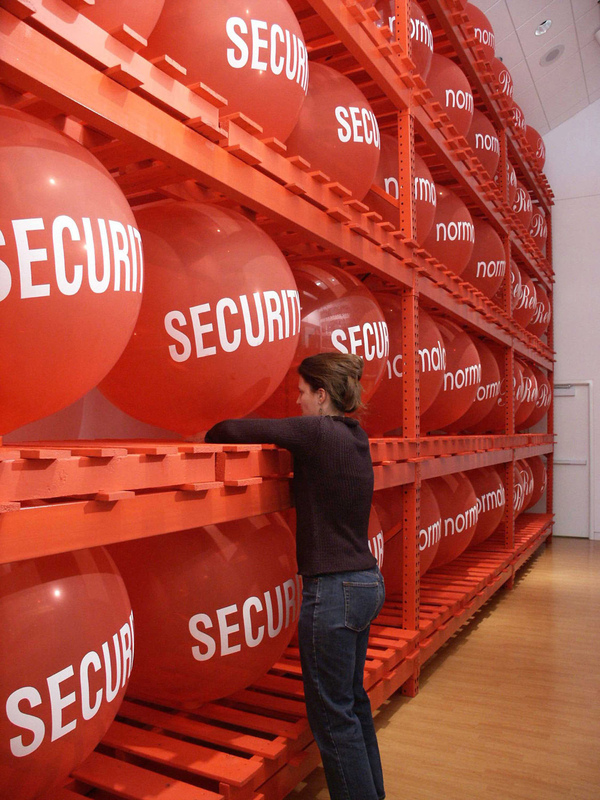 The balloons are objects that contain language and ideals of our times and reference the psychology of consumption. They recall the times when President Bush urged all Americans to fulfill their patriotic duty and shop. This body of work allows the product-surrogates to enter into society and the fabric of everyday life in multifaceted ways.